20-minute training, an instant technique that will make you win a running race during an athletic event. From young to old, you can be an instant champion today. Do you believe that? Probably, it is your dream to run fast and become champion during an athletic event in your community. However, most people believe that they are slow runner, unless daily athlete training is applied. Is there any winning technique? To prove this, we requested two students to join for the experiment. The secret technique on how to run faster has something to do with preventing stumbling accidents among senior citizens. First, there are two things that are wasted among us: "power" and "muscle management". If you can revitalize them, then you will be able to run faster, reduce accidents of senior citizens and will help them prevent bedridden conditions. This 20-minute training will sure make you great and healthy, and of course, you will be the champion of a running race. To prove the method, we requested two boys A and B to run 50 meters. Boy A won 0.1 seconds faster than the B. Now, the new method of running was applied to boy B for 20 minutes. Once again, both boys run for 50 meters. Amazingly, the time was reversed and victory came to boy B with difference of about 2 meters. To verify the effect of the technique, we did let the boys to run 3 times. Also, we requested other boys to do the same. Usually, your athlete instructors will tell you to: step wide and large; hind leg should be high; and extend the line of your backbone. Although we do not mean that these 3 steps are incorrect, this is still not enough to win a race. To win the race, there is one practice which is mainly used for the purpose of bedridden prevention. Two elementary school students who were poor in race were trained by our specialist coach. The coach pointed out that essential muscles must be awakened. This is especially important for bedridden people to avoid fractured bones. Furthermore, walking will be harder when you grow older. Muscular strength will decrease and there are times when you can no longer move your feet that may result of being bedridden. This method will help you run faster and prevent being bedridden. It is in the inner part of the body, the large waist muscle, which moves back and forth. This muscle should be strengthened in order to run faster and avoid being bedridden. The large waist muscle is a muscle that ties the upper body and the lower half of the body. 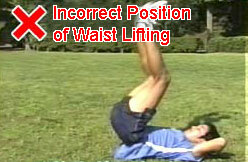 This intestinal waist muscle is mainly used when lifting things with feet. How to awake the large waist muscle? Simple, do "squat" and "waist lifting". Both feet are leveled to your shoulders. The upper body is lowered to extend the waist. Do this 10 times in one set, 3 times a day. Waist lifting is needed to increase your body strength. Left side photo shows incorrect way of waist lifting. 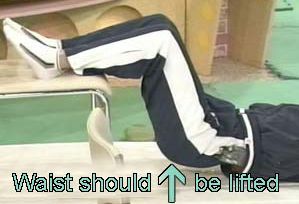 The better way of waist lifting is to put the heel on a stand or chair, and raise the waist slowly. Do this 5–10 times in one set, and at least 3 times a day. The same exercise was applied for school students and the result was remarkable in shortening the running time of about one third of a second. We compared the form of running after the large waist muscle gymnastic method. Students were able to reduce the number of steps in a 50-meter run. To prove the above research, we requested several people to try the large waist muscle gymnastics for at least 5 days. There were no significant changes for the thickness of large waist muscle itself, but their performance had increased dramatically after the training exercise. However, the form of runners looked like they're being drowned in the water. Their shoulders are dancing like seesaw, just like when you are sitting down on a swivel chair. You should eliminate such movement to prevent from consuming excessive energy and power. Well, how to stop such seesaw movement of the shoulders? To start, place some hurdles in the interval of about 2–2½ feet distance for jumping. The secret is not to twirl the body and not to put too much effort in the shoulder when jumping. By doing these training, your running speed will gradually increase, shortening your running time from 0.4 seconds to 1 second. These exercises for large waist muscle are applied for preventing bedridden conditions for senior citizens and speed up athletic runners. For senior citizens, hurdle jumping is not recommended. However, if you are affected by the negative energy, then you should eliminate (eradicate) it first by using the PYRO-ENERGEN. Now, you are a champion of athletic running.